Words by Kevin Doocey on January 15, 2010 . Do excuse the title. It was rather irresistible although probably just a little terrible all the same. 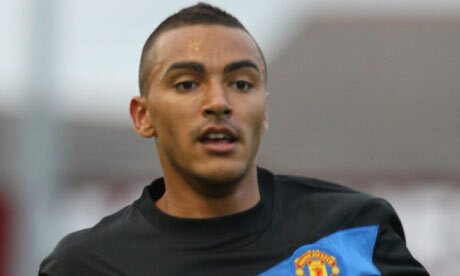 Anyway, if the rumours are accurate and the many of them, Danny Simpson will return to Manchester United in the next few days. This comes as his contract talks with Chris Hughton & co. have resulted in the full-back demanding too much per-week, as listed in the ‘Newcastle United Coca Championship rule book’. As well as this it seems as if Matthew Kilgallon will wait until the summer to leave Sheffield United and Everton is his most likely destination now. Regards our link to Danny Shittu, Chris Hughton this morning ruled out the possibility of signing the Shittu, rather below-par defender. Hughton also outlined his bemusement to hear of Newcastle being linked with a January swoop for the Nigerian international. “There is no truth in the reports we are looking to sign Danny Shittu.“He is not one we are interested in, but we are continuing to work on things in private. Basically he’s saying there’s a bit going on, on the transfer side of things but has no new signings to announce as of yet. Whether Jermaine Beckford will end up in a Toon shirt still remains to be seen, or whether indeed Danny Simpson can come to some compromise and join Newcastle United, the place he says he wants. If he really wants to be at Newcastle, he’ll take a lower wage and sign for a club with hopefully, higher ambitions. As well as this, you may have noticed in one of my previous articles, I recommended my regular reader (Chris Hughton) to look towards signing free-agent Giles Barnes. It seems however as if my other regular viewer (Roberto di Matteo) took notice and has started negotiations with the former Derby County winger. I really think he’s worth a shot and we’ve nothing to lose. It he doesn’t perform and stays injury free, then offload him to lower club, if he works out then we’ll be thanking our luck in signing him. The transfer news will surely begin to increase in volume and credibility we hope. What this January transfer window has to hold for Newcastle (if anything), only time will tell. Doocey, We will end up with no one signing, the ball is in Simpson's court. I will wager that we have offered more than he is currently on at MUFC, if he is so keen to come to us then surely there is room for negotiation i.e give him an increase on condition of promotion. No doubt his dirty agent will tout him about, interestingly though his previous loan clubs, i,e Mackems/Ipswich/Blackburn never offered him a contract. His distribution is awful too. Lets be honest he would be a decent buy but shouldn't be held ransom by him. He certainly will not have the effect on games that enrique does or Beye used to when he was on form, but he is solid and is a decent buy. There are better players out there, but we could do alot worse. barnes would have to be a short term deal imo. he had a lot of promise, but injuries and ego seem to have totally annihilated that over time. let's face it, players dont get released from contracts early without good reason. True Chris. But I still think he'd be worth a shot. We could do a lot worse as many have pointed out. Still think Espinoza on trial from Birmingham wouldn't be bad. Better than bringing in absolute Shittu. Some understandable confusion there I may be able to clear up.... Ashley is actually signing Jack Shitt (actually no relation of Danny's although I'm told he may be close to little Dennis Wise). Suely nobody will be surprised when Fatso sells off more of Newcasle's "assetts" and replaces them with loanees or free transfer rubbish. CH making excuses about our wage bill already? It seems to me that all reported signings (Beckford,Simpson etc) are all dead in the water. He thinks our wage bill is bad now?? Just wait and see what happens to the club if we don't go up this season. Surely the money for Beckford and Simpsons wages are a snall gamble for proven Championship players who IMO will help up out of the league. Prepare for another 12/13 days of stupid rumours, then a rushed loan deal for some out of form and/or unfit premier league journey man. If we can only make loan signings how about Vladimir Weiss from City or Kevin Phillips from Birmingham? Do we really think Kevin Nolan will get another 11 goals in the second half of the season? Ameobi, Carrol AND Ranger only have 12 league goals BETWEEN them. Surely by letting Geremi go for nowt should free up enoughh cash to sign Beckford and Simpson?? we will sign nobody of quality because the fat one only takes. he might even sell some of our assets. I know it makes no sense but the fat one is football clueless. he has lost over a billion in the last year. so he is generally clueless. he will not even increase the bid for beckford by a few hundred grand in order to give us a better chance at promotion. held to ransom? don't make me laugh. Nobby Solano training with 1st team…………….. Just got back from taking my son to football training at Northumbria Uni at Coach Lane, one of the other parents went to NUFC training ground prior to attending his son’s training and saw Nobby. I promise you all that this is not a wind up. Maybe they are looking at an alternative to the Simpson deal which appears dead. Personally I would have Nobby back as he could offer cover in midfield as well as RB. jimiley , i couldn't agree more - just a few words sums the useless fat get up... ....by the way did you know ed's blog is back up and running , it's as if he's never been away ! no explanation or nowt - very strange. ...all the usual characters have all flooded back aswell good &amp; bad , i'm not to sure whether i'll be going back on tho as bloggers i thought were my friends turn out to be nothing better than back stabbers.relationships i have built over the the last few years lie on the floor in tatters &amp; are unrepairable ,there's one in particular that will never acknowledge again. Hitman , your nothing but a lazy b@stard &amp; i hope you choke on your beer. it's nice to be nice , i hope you's live happily ever after - pass me that bucket till i puke up please.